Today, I drove about two hours away to Hopefield, South Africa. Currently thirty foreign shop owners are currently seeking refuge at the Hopefield Mosque due to xenophobic violence in their town. Shops owned by Somalians, Ethiopians, and Bangladeshis were looted and destroyed the Sunday before. During the violent robberies, one of the attackers was stabbed to death by a shop owner, and that shop owner has not been seen by his friends or family since. Now these men and their wives are suddenly homeless and face insecurity in the place they call home. While the Muslim community has been extremely caring and welcoming to these residents, living at the mosque is not a permanent solution. The mosque does not have enough funds to feed all of the displaced persons, and no one knows when or how these people will be able to rebuild their homes, and live in security again. It is important to note that not all Hopefield residents are xenophobic. The people who we spoke with at the mosque said they had felt welcome and safe for many years in Hopefield before this happened. While the reporter I was working with spoke with various men and women seeking refuge at the mosque, I walked around and tried to capture the injustice these people are facing, and how this event has affected them. 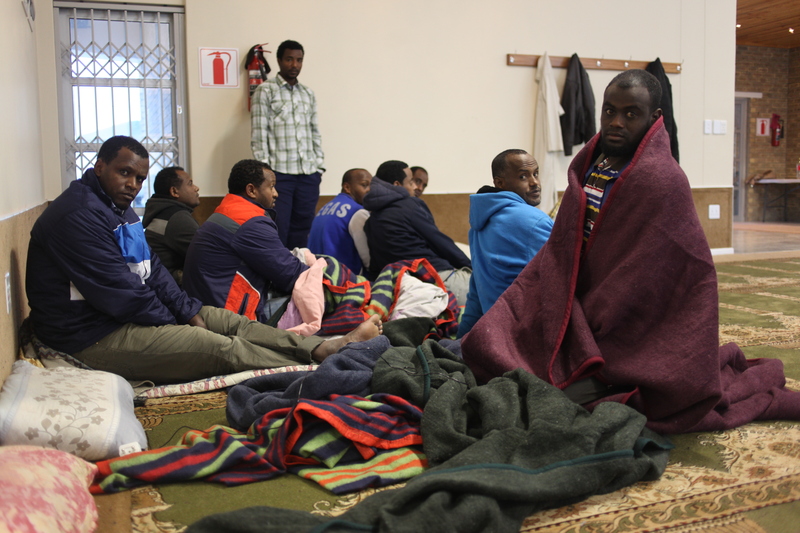 1) [Located at top of blog posting] Some of the shop owners who are seeking refuge at the Hopefield Mosque. 2) Mohamadek Husein Mohamad, one of the shop owners who suffered an attack. 3) Nadiya Baru, a Canadian who is married to one of the shop owners. 4) The remnants of a shop, destroyed by a gang of xenophobic Hopefield residents.